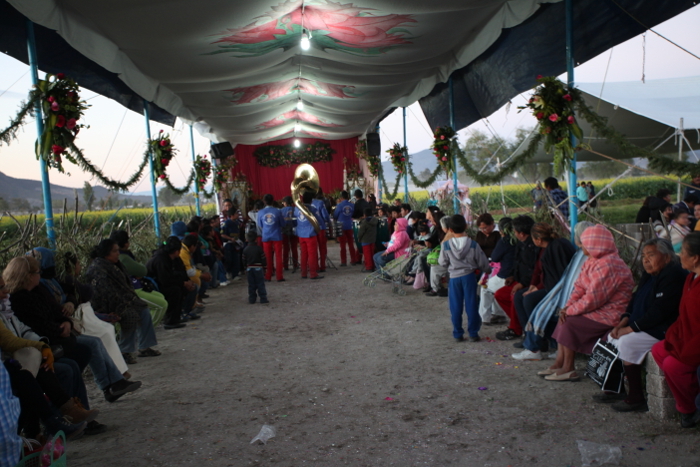 The Last Fertility Dance (in Central Mexico)? What will anthropology/ethnography be in the future? One could argue that recording cultural variation will decline as it disappears and William Greider’s book title becomes more of a reality: ‘One World Ready or Not: The Manic Logic of Global Capitalism’. In 1992, I co-authored “Our Vanishing Global Ethnicity: Goodbye to Mexico’s Otomí” (The World and I). That article described the on-going acculturation of Mexico’s Indian groups, (including language loss) with specific attention on the Otomí. 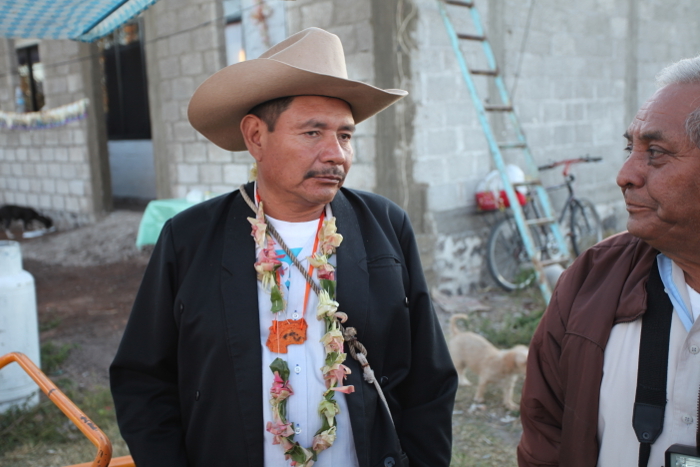 This current article foreshadows the possibility of the soon-to-be total demise of the Otomí. 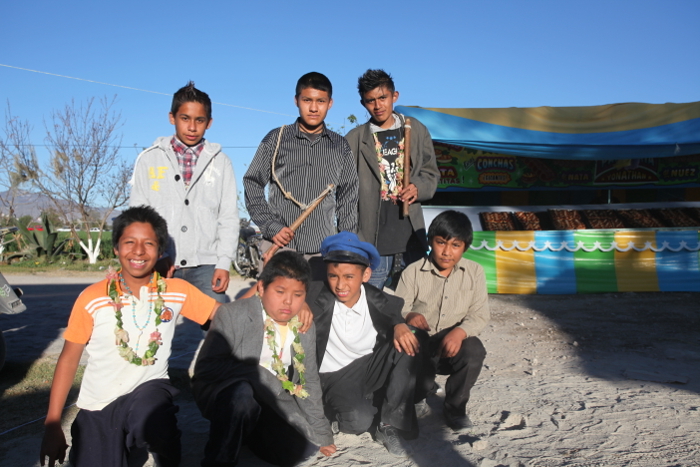 At present, there are about 200,000 Otomí in Mexico, down 100,000 from 25 years ago. The Otomí are the largest Native American group in central Mexico, and traditionally they worshipped the moon as their highest deity. The year 1521 saw the collision of two very different religious systems in Mexico: that of the invading Christians and the one of the native animists. The Catholic padres (priests) identified three major problems to be addressed: the concept of sin, worshipping inside (buildings/churches) instead of outside, and ritual dancing. In Mexico, very little of the natives’ animistic systems survived the Christian onslaught of building 12,000 churches over a 300-year period. However, certain ritual traits scattered throughout Mexico’s spiritual landscape bespeak animism, all with syncretistic Catholic overtones. 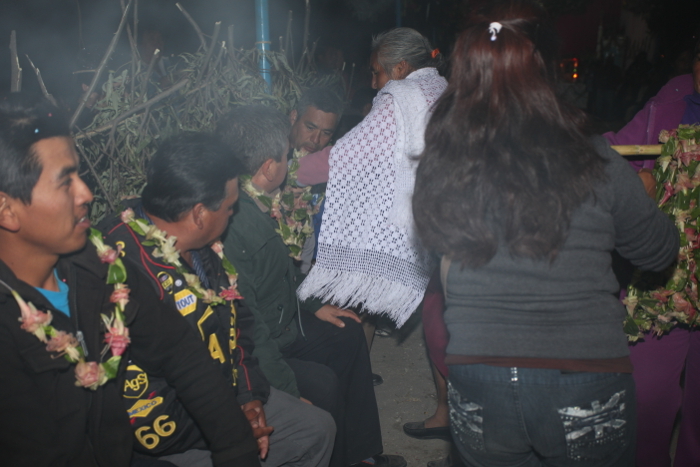 So, in 2014, I was stunned to realize that I was witnessing a surviving Pre-Columbian 20-day ceremony, Pone Bandera, in the pueblo (village) of Mixquiahuala, Hidalgo (two-hour drive north of Mexico City). In this note, I focus on the Pone Bandera dance, which I closely observed in February 2015. Pone Bandera (‘Place the Banner’) is a floral/fertility ceremony with 13 major interrelated components, one of which is a dance. Outside of regional publications, nothing has ever been published about this highly important ceremony. And after seeing this ceremony on several yearly visits, I decided to publish a general photo essay of my 2014 observations (Stocker 2015). The dance is quick skipping and this man dances with his son. The individuals dancing behind are the assistants of the native priest. Notice the confetti in their hair and the floral leis worn by all. Pone Bandera, a blend of Christianity and animism, is split between the two halves of Mixquiahuala, with San Antonio representing one side and San Nicholas the other. 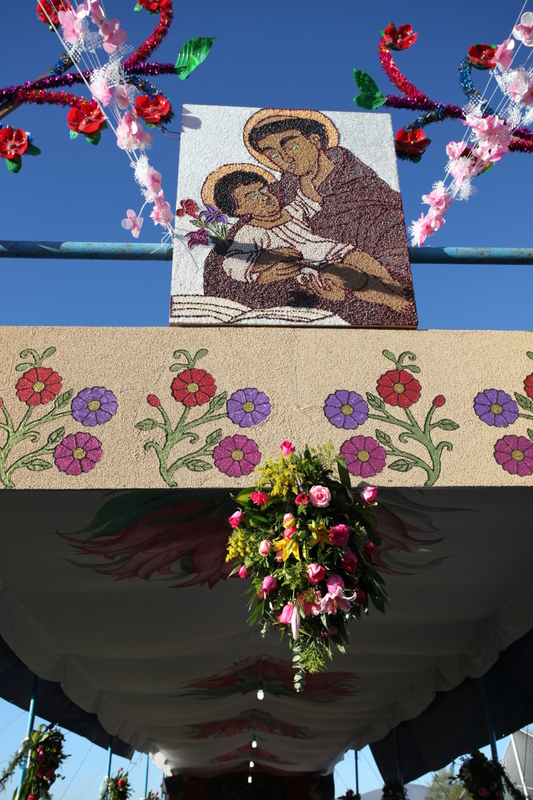 Despite the fact that processional banners display either the images of each respective saint or a Christian cross, the people of the pueblo describe the entire process of Pone Bandera as an animistic, sexual-metaphor. 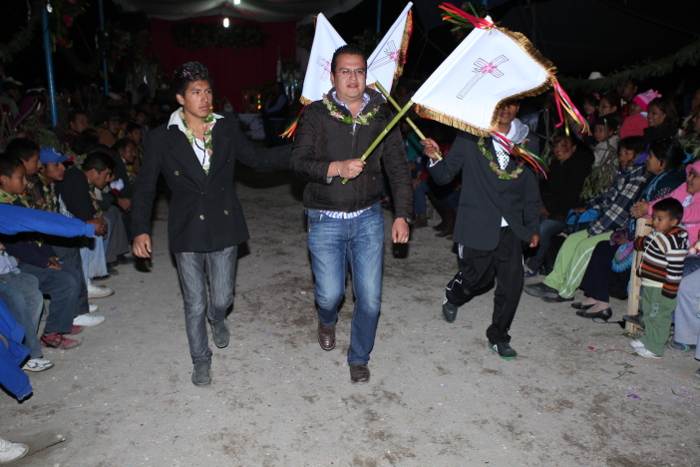 Every year, two mayordomos (stewards), one from each side of town, volunteer to underwrite the event financially. And not only must each mayordomo provide a small, public chapel to house the saint’s idol (and banners) for his side of town for one year, he must coordinate the event. Not just anyone can do this because the financial obligation is considerable. Thus, prestige in the community is significant, as well as presumed spiritual rewards. The ceremony of Pone Bandera begins on a certain day (determined by the native priests, described below) when a select group of pilgrims, comprised of men and boys, begin a two-day pilgrimage to a sacred grove hidden high up on the slopes of a distant mountain, where they collect about 5,000 red and white tillandsias, a flower growing on oak trees. After carrying the flowers back to town, another group, comprised mostly of women, trim and fold the flowers’ petals and string them along with orange leaves into rosarios (necklaces/leis). 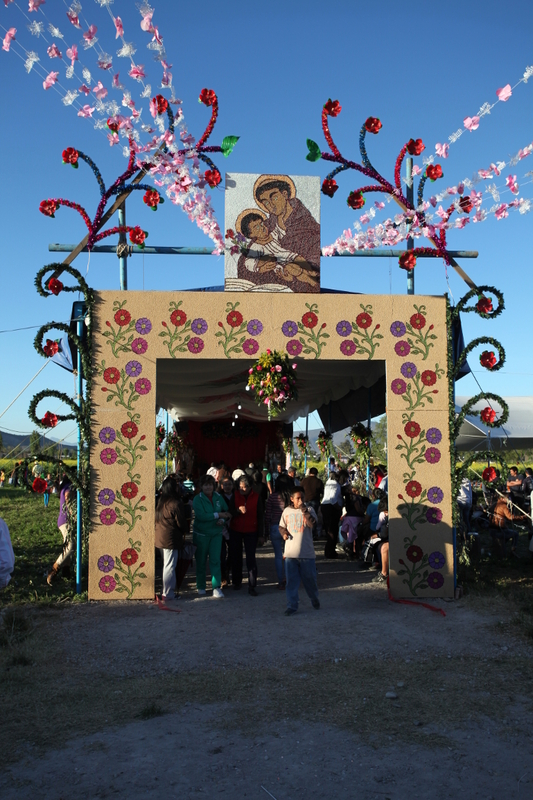 During the following week, the men, on each side of town, build an ermita (pavilion) for the dance, along with a high platform on which the bandera (banner) will be placed. In addition, the women prepare a ceremonial meal to be consumed by the villagers who take part in the ceremony. The front of the ermita. Notice the painting of the tillandsias on the cloth ceiling inside. Floral bouquets are in abundance. The ermita just before the dance. 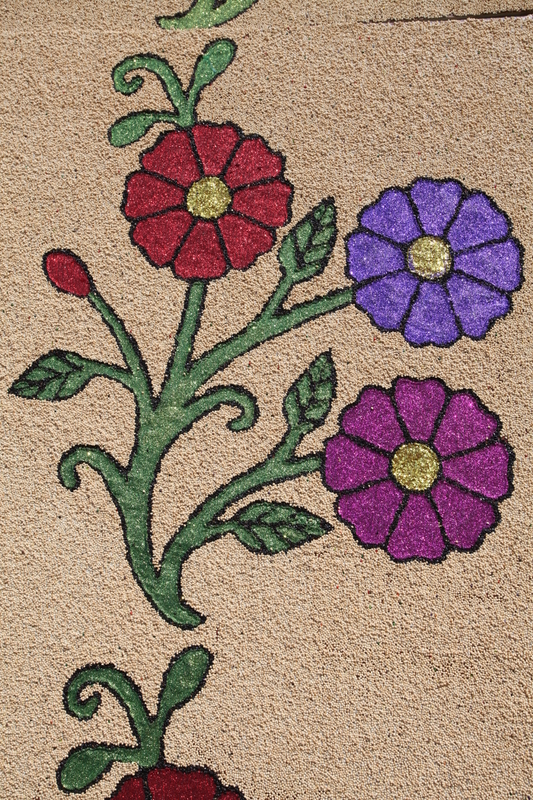 Flower imagery abounds for the floral/fertility ritual. The arcades prior to 2015 were done with painted yucca leaves, which are now endangered and can no longer be cut. 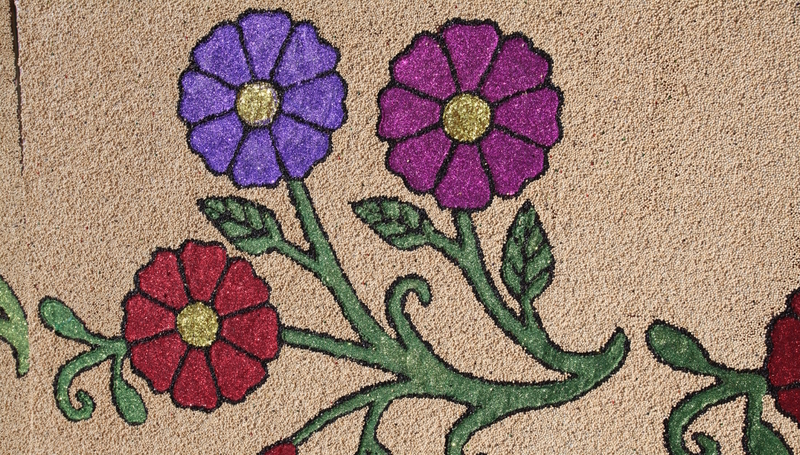 So, 2015 began a new era of using seeds and glitter for decorations. For the most part, pagan priests, shitas (“grandfather” in the Otomí language) direct Pone Bandera. To become a shita one must make the flower pilgrimage 49 times. However, Pone Bandera is punctuated by three masses, one of which is held outside. The oldest shita gives the commands at the dance. The maize cake around his neck is similar to a wafer in Christian communion. He gives a bit to any who asks and upon consumption a greater spiritual connection takes place for the consumer. This shita is not that old, but in 2013 the oldest shita died and the now-oldest is deaf. The youngest shita and apprentices. 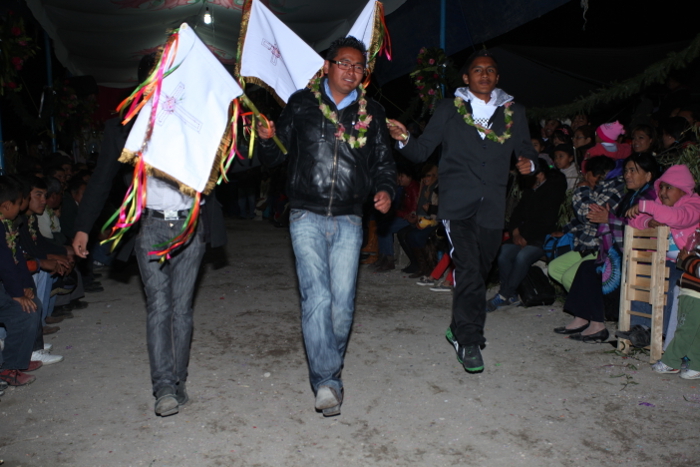 The shitas and apprentices move through town with marionettes to entertain the people and ask for support for the event through: participation, food donations, or money. The older shitas use desiccated animals, the young apprentices use plastic dolls. (A similar Colonial example from Yucatan is described in Dances of Anáhuac [Kurath and Martí 1964: 31, 63]). 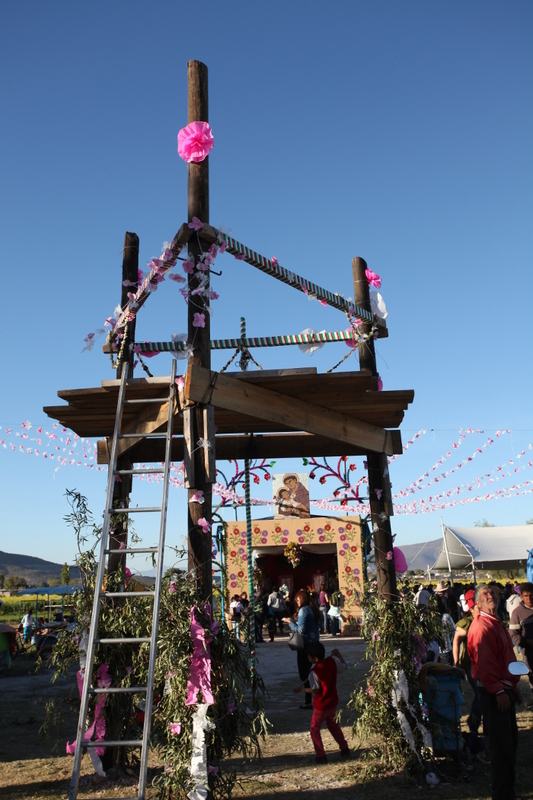 The shitas also conduct the dance held in the ermita, and it is the main shita who places the banner in its proper receptacle on the platform, thus simulating symbolic copulation, which fertilizes the Earth. In the not too distant past, much of the shita’s words were in Otomí. These days, none of the young apprentices can speak Otomí. In 2015, I recorded the dance, and having just read Dances of Anáhuac, I was excited to explore another realm of consciousness. 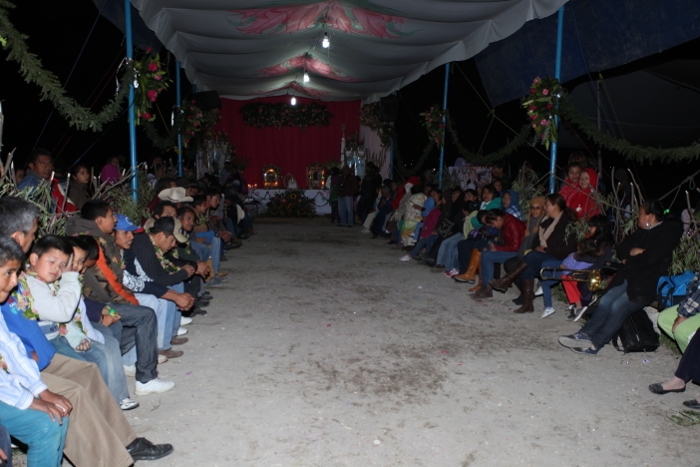 The dance is conducted in the pavilion (ermita), where benches are placed along each side, with men sitting on the left (looking in), women on the right; however, only the men dance. The dance begins after sundown, and Kurath and Martí (1964: 43) describe the night dance. The ceremony of Pone Bandera always takes place in February, and the purpose of the dance is to create a ‘shaking’ in the Earth (telúrico), which warms the Earth. The men and boys seated in the ermita for the dance are those wanting to participate in the ‘heating’ of the Earth, which has chilled through the winter. In 2015, approximately 50 men participated (of a total population of approximately 5,000). 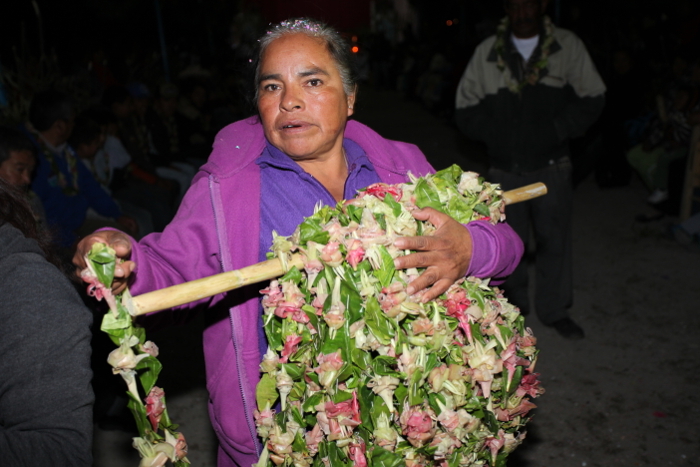 The rosarios (flower necklaces) are considered to have a feminine force, and immediately prior to the dance, a group of older women incense the leis and place one over each man’s head, and this is considered symbolic sexual penetration; and when the leis are worn by men, communal fertility is initiated. Woman carrying the rosarios, just before the dance. Placing of the rosarios on the men just before the dance. Moments prior to the dance, only men are seated on the left. Notice the people standing behind who will stand through the entire two hours. For the dance, the main shita, along with his young apprentices, stand at the front of the ermita, and two of the older apprentices will dance with the men one-by-one. The older apprentices do the dancing because it is too much exertion for older shitas. Also, the oldest shita, directing the dance, will yell out references of sexual fecundity, e.g. : “Move like a rabbit!” And, all three men will skip down the center of the ermita, turn about, and skip back. I call the dance a skip. However, while watching the dance, I asked the locals to describe the movements for me, and they used the words brincando (romp) and saltando (jump), like a rabbit. The dancer must wave his banner back and forth as he dances to the end of the ermita and back. Notice some women applauding. Notice a representation of the tillandsia on the middle of the cross. Notice people in the background, who are relatives and friends of the men dancing. Again, the movement of the men (male) shaking the rosarios (female) on their necks creates a sexual energy, which transfers into the Earth, warming it. After about two to three hours of dancing, with some men repeating, it is time for Pone Bandera. The oldest shita places the banner in its holder on the raised platform to simulate the union of the sky (male) and the Earth (female), a symbolic copulation signifying the fertilization of the Earth. The photos here are of the Saturday night dance for the San Antonio side of town. On Sunday night, the entire process will be repeated on the San Nicolas side. The banners will stay in their holders for one week, and then Quite Bandera (‘Remove the Banner’) ends the 20-day ceremony. The Earth is now ready for accepting seeds for planting. 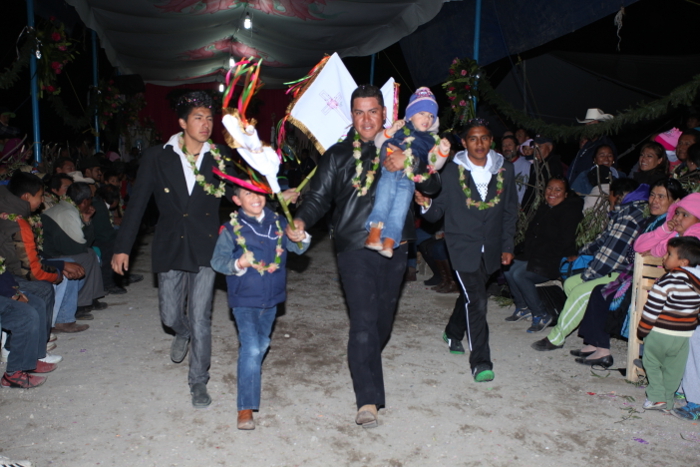 Is Pone Bandera really the last fertility dance in Central Mexico? We will have to wait and see, but it is possible that Pone Banera will disappear in approximately 20 years, or maybe even five, because the young people are simply going through the motions at the behest of their parents. Hopefully, someone will make a full-length documentary by 2018. (On YouTube website there are vague journalistic presentations about “Pone and Quite Bandera”). I can imagine that in the past, during the Spanish contact, the entire community was involved and participated, speaking only Otomí. Just in the five years that I have been observing parts of this ceremony, participation has dwindled. Many Catholics find Pone Bandera an animistic embarrassment. But the biggest impact is from the youngsters who find solace in their cell phones which provide the connection to the modern, globalized world in which they want to participate. Finally, to judge by Pone Bandera and my anthropological observations in Mexico, anthropology/ethnography has changed from its original purpose and goals: the study of, and comparison of, small groups, to analyzing the complexity of the current social world. Indeed, it is a credit to GE for providing an outlet for the transformation of anthropology/ethnography into digital age. I have shown GE to many people on their cell phones. So, that which is causing the demise of variation (cell phones) can also pave the way for educating us about who we are becoming. Ginzberg, Carlo 2013. The Night Battles: Witchcraft and Agrarian Cults in the Sixteenth and Seventeenth Centuries. Baltimore, MD: John Hopkins University Press. Greider William 1998. One World Ready or Not: The Manic Logic of Global Capitalism. New York: Simon & Schuster. Kurath, Gertrude and Samuel Martí 1964. Dances of Anáhuac: The Choreography and Music of Precortesian Dances. New York: Wenner-Gren Foundation for Anthropological Research. Stocker, Terry 2015. “Pone Bandera: An Amazing Pre-Columbian Ceremonial Survival in Mexico.” Expedition. In Press.